Jeremiah the prophet thunders against Israel's careless leaders (the king, some priests, some court prophets). These had no concern for the poor. The prophet also predicts the rise of a good, new shepherd in the family line of David. The "you" in this reading are Gentile converts to Christ. The "we" are Jewish converts to Christ. The law that Christ abolished means the law of Moses kept exclusively by the Jews. Jesus had sent his twelve closest followers on missions, to preach repentance, drive out demons, and cure the sick. Now they report back. Our Liturgical Setting: Today's gospel, Mark 6:30-34, says that a crowd of followers seemed to Jesus "like sheep without a shepherd." His response is to teach them. This passage from Jeremiah, roughly 600 years earlier, is about negligent "shepherds" (king, priests, other prophets) of God's "flock," the simple people who needed and deserved better leadership. Historical Background of Jeremiah: The prophet lived from about 650 B.C. to perhaps 580 B.C. Most of his work was in Judah's capital Jerusalem. He tried to keep the people and several kings faithful to God amidst an atmosphere of political intrigue and backstabbing. Jeremiah was blunt about what was right and what was not, and he suffered at the hands of the powerful because of his outspokenness. For details, see these Notes, which quote liberally from the Introduction to Jeremiah in The New Jerusalem Bible. Even more specifically, at the time of this prophecy, a good king in Judah had just been replaced by a king who put the country in thrall to Egypt. Jeremiah raged against this policy, on the grounds that God's people should trust in God, not in alliances with pagan nations. Some obsequious "prophets" of the court backed the king and criticized Jeremiah. Proclaiming It: This is Jeremiah's response. In your proclamation, don't let Jeremiah sound like he's on Valium. If anything, he should sound like steroids and caffeine. He was a vigorous, courageous, outspoken man. Today we'd say Jeremiah had fire in his belly. Here he thunders on behalf of a God outraged at the powerful people's neglect of their responsibility to the poor. "I gave you the privileges of a shepherd, you mislead and scatter the flock, I'm about to replace you, and my people will be restored!" The Historical Background: This passage from Ephesians continues the theme introduced last Sunday, that Christ has brought about reconciliation between ancient foes, the Jews and the Gentiles. From the author's perspective, the Jews were "near" and the Gentiles "far off." The letter is from a member of "us," those Jews who, having enjoyed God's favor for so many generations, have now accepted Christ. The letter is to "you," Gentiles, long estranged from God but now accepting Christ, too. 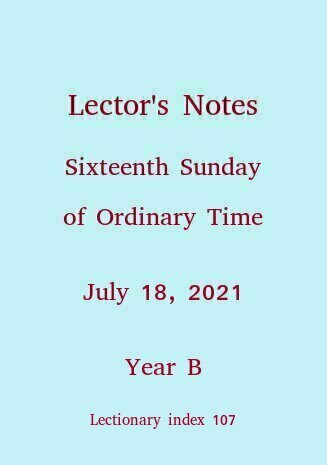 Proclaiming It: Your task as lector is to make sure the congregation understands this historical change. The ancestors of your hearers were once on the outside, without even enough spiritual sense to be looking in. Now we are in, together with the original insiders, and that's the greatest privilege imaginable. Be sure your voice contrasts the contrasting parties and conditions here. There are 66 words in the second sentence (of only three sentences). The translators were being strict, I suppose, but the editors of the printed Lectionary have been as merciful as they could be, breaking up this giant sentence into sense lines. Practice your pauses. Stop long enough where the sense lines suggest it, but not so long that what follows is noticeably a sentence fragment. 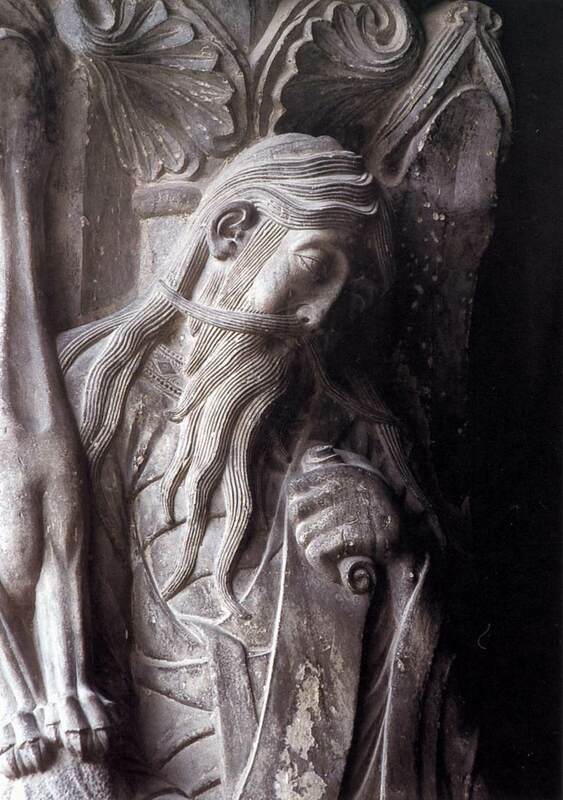 Jeremiah, stone, on the eastern side of the trumeau of the south portal of the Abbey of Saint Pierre, Moissac, France, 1120-35. The image here is from the Web Gallery of Art. The abbey is well described and photographed at Mary Ann Sullivan's website.